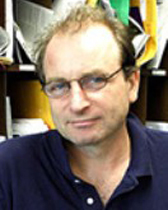 Scott Durham (Ph.D. Yale, 1992) is Associate Professor of French and Comparative Literature and Director of Graduate Studies in French, as well as being former Chair of the Department of French and Italian. His main interests are in 20th- and 21st-century literature, film, and theory, with particular emphasis on Foucault, Deleuze, and Rancière, as well as the Marxist critical tradition. He is the author of Phantom Communities: The Simulacrum and the Limits of Postmodernism (Stanford University Press) and the editor of a Yale French Studies issue on Jean Genet. He is currently writing two books with the working titles Eurydice’s Gaze: Historicity, Memory and Untimeliness in Postwar Film and The Archive and the Monad: Deleuze and the Resistance to Postmodernism, as well as co-editing (with Dilip Gaonkar) a collection of essays, Distributions of the Sensible: Rancière, Between Aesthetics and Politics. Among his recent publications are essays on the films of Jean-Luc Godard ("'An Accurate Description of What Has Never Occurred': History, Virtuality, and Fiction in Godard ", in the Wiley-Blackwell Companion to Jean-Luc Godard), Michael Haneke ("Codes Unknown: Haneke’s Serial Realism," in the collection On Michael Haneke) and Abderrahmane Sissako’s film Bamako ("The Center of the World is Everywhere": Bamako and the Scene of the Political" in World Picture (http://www.worldpicturejournal.com/WP_2/Durham.html). Professor Durham's other publications include articles in such journals as October, Paragraph, Sites, Yale French Studies, L'Esprit Créateur, and Science-Fiction Studies. In addition to critical writing on literature and film, he has also done collaborative work with filmmaker Jeffrey Skoller on his film, The Promise of Happiness. Professor Durham has received the ASG Faculty Honor Roll Award, as well as serving as Jean Gimbel Lane Professor at the Alice Berline Kaplan Center for the Humanities.